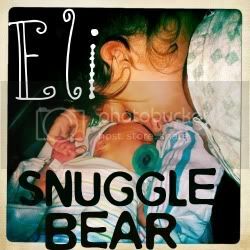 Snuggle Bear Eli: Squirms and screams. The best part about being a Mom is, you can be completely OBSESSED with your little one, and it's not creepy one bit! So go ahead, take a billion pictures, kiss them a thousand times and cuddle as much as possible. I have to admit, I'm boarder line obsessed with little Eli. I don't think I could be more in love with him then I already am. That doesn't mean sometimes I don't crave a good long selfish time to myself. I do, trust me. But I would never want to miss a second of his new innocent life. Lately, all he does is scream at the top of his lungs over and over just to hear his own voice. Roll over, grab toes, and bite everything!!! and of course... kick kick kick.